Oh how I LOVE my Ninja! Best appliance I've ever owned! 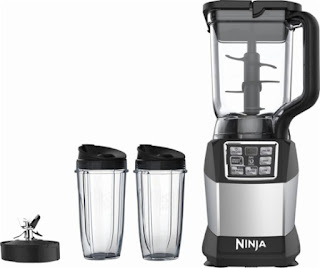 Today ONLY (3/10) - this Ninja - Nutri Ninja Auto-iQ 6-Speed Blender for $79.99 (Retail $159.99). So worth the price. Customize your juices and smoothies with this Nutri Ninja Auto-iQ blender. Total Crushing Technology turns ice into slush quickly to create creamy frozen smoothies, and the included double-walled stainless steel cup keeps your drinks icy cold for up to four hours. Use this Nutri Ninja Auto-iQ blender for speedy juicing of whole fruits and veggies.